Sat Nam and welcome to Raj Khalsa Gurdwara. The Gurdwara is located at 22821 Silverbrook Center Drive in Sterling, Virginia 20166.We invite you to join us for Sunday Gurdwara services each week beginning at 10am. Our Gurdwara program consists of 90 minutes of devotional Gurbani Kirtan followed by Samapti and Lungar. Lungar is served at around 12:15PM. On Gurupurabs we often have additional Kirtan or a speaker. Please join us as we sing the Guru’s praises and listen to His words of devotion. Our Sangat has grown over the years and we generally have 400 -500 members attending Gurdwara each week. It is a beautiful community that joins together in devotion to God and Guru. We have created a sacred place of worship where the Guru’s Word holds court, and where we honor each other in an environment of mutual respect, friendship and service. Raj Khalsa Gurdwara is a meditative environment where you can bow your head and sit in the peace and ecstasy of the Guru’s vibration. We also strive to make this an inspiring experience for children, and encourage them to participate in the Kirtan and some of the seva. We are blessed to have many inspiring and devoted Ragis to play Gurbani Kirtan each week, and you will hear both traditional Eastern instruments, such as the harmonium and tablas, as well as Western instruments, such as the guitar and piano. We offer the English translation of the Shabads as well as the English and Punjabi translations of the Hukam. Please join us and enjoy the love and grace and nobility that is Raj Khalsa Gurdwara! Sikhism, one of the youngest of the world religions, is barely five hundred years old. 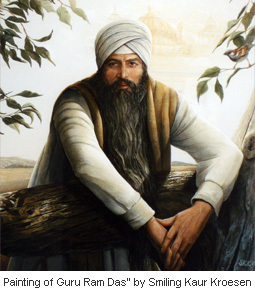 Its founder, Guru Nanak, was born in 1469. Guru Nanak spread a simple message of “Ek Ong Kar”, translated as “We are all one, created by the One Creator of all Creation”. This was at a time when India was being torn apart by castes, sectarianism, religious factions, and fanaticism. He respected all religions and expressed the reality that there is One God and many paths, and the Name of God is Truth, “Sat Nam”. Click for more information on Sikhism and the Sikh practices.